A ray of light out of tragedy. Following the heartbreaking death of Reuben Williams in a car crash this time last year, his grieving grandparents have made every effort to generate positivity from real tragedy. Reuben, 3, was in a car on Plymouth Road, when it was hit by a drink-driver, Andrew Vass who is now in prison on a charge of causing death through dangerous driving. Grandparents Simon Williams and Susan Taylor are established poets who already publish an annual poetry magazine called ‘The Broadsheet’. An unusual affair with poetry from many contributors crammed on to two sides of an A1 sized sheet, that can be folded into 8 A4 pages. This year, for obvious reasons, things are very different. 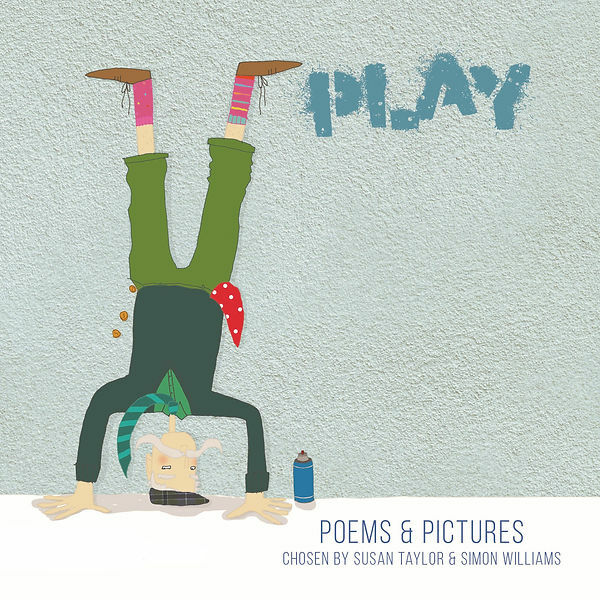 Susan & Simon have put together an anthology of poetry in honour of Reuben, simply called “Play“. It is thought that a book of poems around the subject hasn’t appeared before to cover all aspects of fun activities. From hopscotch to cricket, shadow puppets to computer games and rock climbing to the quiet and reflective activity of reading. However the book is not an end in itself. Money raised is going towards a new play-park next to the petanque court on Vire Island. Earth Wrights based in Dartington have been commissioned to create, build and install a climbing structure. The work is already well under way and the costs will be paid for out of sales from the book alongside monies that have been community sourced with the great help of Sima Cutting of The Kitchen Table. Play features over 150 poems from more than 100 poets including contributions from world famous local poets such as Matt Harvey, Alice Oswald, Brian Patten and Sheila Aldous. It is augmented by full colour illustrations from many artists including Totnes locals, Claudia Schmid, Paula Cloonan, Tom Williams, Carol Ballenger and Juno Joy Cadbury. A launch party has been organised and will be held on the 11th December in the Seven Stars Ballroom from 5:30pm where the book can be bought for £10. A number of poets will be in attendance giving readings along with live music perfomances from Anna Karthauser and Chris Howe along with guitar compositions by the current Bard of Exeter, Kimwei. The book costs just £10 and all profits will go to the Play Park Project in memory of Reuben Williams. The book will be available to buy at the launch; plus, the Belle Book and Castle community bookshop on Castle Street also has the book in stock. Four days of great drinks, great food, great entertainment and great atmosphere. Food throughout including KitchenTable BBQs on Friday and Saturday. Entertainment includes: Friday – DJ grooves; Saturday – Windjammer; Sunday – Skeddadle; Monday – Irish Session. Teign Artists are known for working with an interesting and wide variety of creative media in fresh and exciting ways. “Out of the Ashes” will be a combination of eight artists’ work from the group; some showing retrospective, but mostly current and new work …with a glimpse of what may come next. The eight Teign Artists exhibiting are: Rachael Bennett (landscape painting and drawing), Luci Coles (mixed media painting and sculpture ), Patricia Ferns (textiles and silk painting), Josie Gould (contemporary landscape painting and textiles), Mei Lim (photography, painting and printmaking), Elizabeth Rashley (lino prints), Ray Vyse (Digital art and Anisotropic Art), and Ben Yates (mixed 3D media ). “Out of the Ashes” will be marked by a symbolic burning of a 14′ tall reclaimed wood sculpture by Ben Yates, held prior to the exhibition, the remnants of which will become the medium of some of the exhibited works. Get ready for Peppa Pig’s biggest celebration yet! This delightful new release offers a whole hour of snorts and giggles. Little piggies can look forward to 10 brand new episodes as well as exclusive new interactive entertainment featuring little ones singing and playing along with their favourite onscreen characters. Join the party with Peppa and George in their brand new adventures as they dance in the mud at a festival, celebrate Grandpa Pig’s birthday and take their own trip to the cinema! With songs to sing along to and games to join in with, pre-schoolers and all the family will have heaps of fun with Peppa and friends. Collect a loyalty card at the Box Office. For every five films you see, you’ll get the sixth one free; this applies to child tickets for BarnKids screenings only. A 700-year-old story awaits you on our volunteer-led Deer Park tours – learn about the people who lived here, the magnificent landscape, the deer themselves and the abundant wildlife. The Deer Park is an exciting new development for Dartington. It includes the repair and restoration of Dartington’s historic Deer Park Wall. Also through essential and lasting conservation works, creating new accessible and interpreted walks through the surrounding parkland. We are encouraging more people to engage in the landscape including through a new schools’ programme and new volunteering opportunities. Every Monday, 2-3pm, and Friday, 11am-12 noon. Tours are free – there is no need to book. In order to help keep this place special for everyone. An opportunity will be provided at the end of the tour for attendees to make an entirely optional donation towards the Gardens’ upkeep. Willem Dafoe gives a magnificent, Academy Award®-nominated performance as Vincent Van Gogh in Julian Schnabel’s (The Diving Bell and The Butterfly) portrait of the famously troubled post-Impressionist artist. Shot in the south of France, it follows Van Gogh through his difficult final years as he struggles to make a living and maintain bonds with the people in his life – including his brother Theo (Rupert Friend) and painter Paul Gauguin (Oscar Isaac). A heartfelt film, At Eternity’s Gate pushes its sympathetic imagination inside the mind of the artist to depict Van Gogh’s ecstatic creative response to the beauty of the natural world, alongside his tremendously painful sense of isolation. Following in the cinematic footsteps of Pasolini, Jarman and Fellini, Italian writer director Alice Rohrwacher’s follow-up to her 2014 hit The Wonders is a luminous magic realist fable paralleling a modern Italy consumed by corruption and decline. Lazzaro (Adriano Tardiolo) is a beautiful peasant, whose village is ruled over by a Cruella de Vil-esque Marchesa (Nicoletta Braschi). Making unlikely friends with the Marchesa’s petulant son Tancredi, he’s convinced to help stage a dramatic incident to secure a ransom. Beautifully shot and incorporating some truly exquisite imagery, Happy as Lazzaro evokes both nostalgia for rural innocence and the melancholy of urban decay. The F-Rating is awarded to films directed by a woman and/or written by a woman. Films that also feature significant women on screen in their own right are Triple F-Rated. Cast: Willem Dafoe, Oscar Isaac, Mads Mikkelsen, Emmanuelle Seigner, Rupert Friend, Niels Arestrup. Earning him an Oscar® nomination, Willem Dafoe is mesmerising as Vincent van Gogh in this latest from Julian Schnabel (The Diving Bell and the Butterfly). Covering his time in Arles and Auvers-sur-Oise, we nd a complex, troubled soul who is seeking a new visual language, while also struggling to make sense of himself and his connection to those around him, including Paul Gaugain (Oscar Isaac) and a confiding priest (Mads Mikkelsen). Shot with a painter’s eye, Schnabel’s once again shows his talent for working with complex biography and the lives of artists. Jessie Buckley gives an irresistible performance in Tom Harper’s Wild Rose, the rousing, joyous story of a young Scottish woman balancing her dreams of singing stardom with the responsibilities of motherhood. Just out of prison, with two young kids, Rose-Lynn Harlan (Buckley) is bursting with raw talent and longs to make it out of Glasgow to sing in Nashville. Her mum (Julie Walters) is at odds with her dreamer daughter, but when Rose-Lynn gets a cleaning job, she finds an unlikely champion in her new boss (Sophie Okonedo). With excellent performances all round, the film’s knockout blow is Buckley, who oozes charisma and vulnerability while singing brilliantly throughout. Who’ll Get Your Vote on May 2nd? Meet the Candidates and Raise Your Qs! ‘Newton Says No’ Takes the Fight to Teignbridge Election! Copyright © 2018 Totnes Pulse. All Rights Reserved. The Magazine Premium Theme by bavotasan.com.